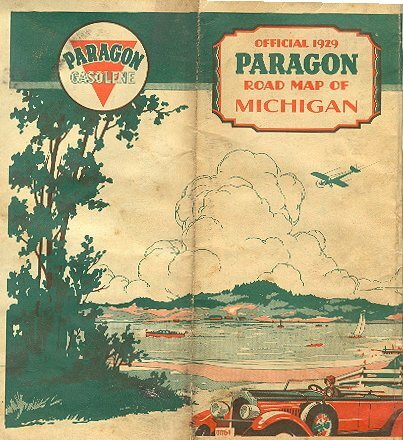 A 1928 Paragon map cover from Walt Wimer. 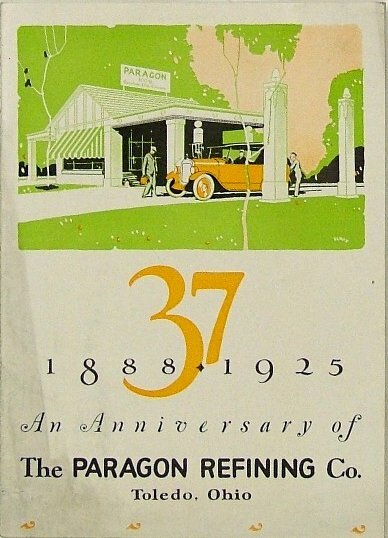 A 1929 Paragon map cover from Walt Wimer. Cover for a 1925 Paragon publication, from Robert Stephens. from the above 1925 Paragon publication. From Robert Stephens. A reproduction of a Paragon sign, from Robert Stephens. 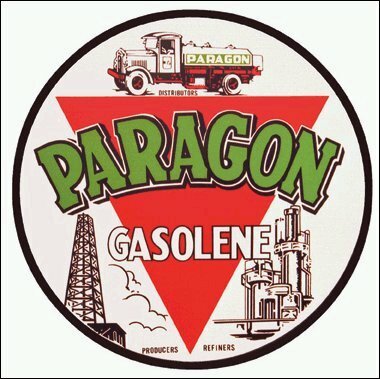 gasolene, some companies once used this spelling. 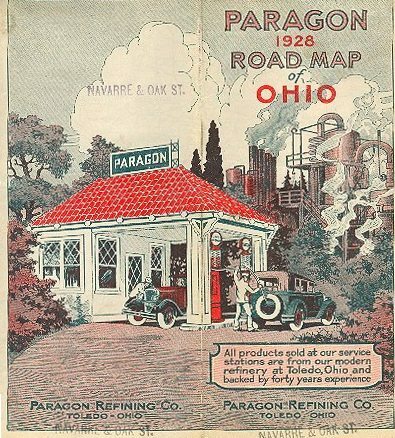 "Now negotiations with the Paragon Refining Company were completed, and Gulf bought Paragon's facilities including 344 bulk and service stations in Ohio, Indiana and Michigan and a refinery at Toledo. The Toledo refinery was rebuilt to round out the midwestern manufacturing development. The program's total cost in 1930 was more than $63,000,000, and $25,000,000 more was spent on it in 1931." Some information on the number and stores and the locations are described on the inside of Walt's 1928 map shown above. 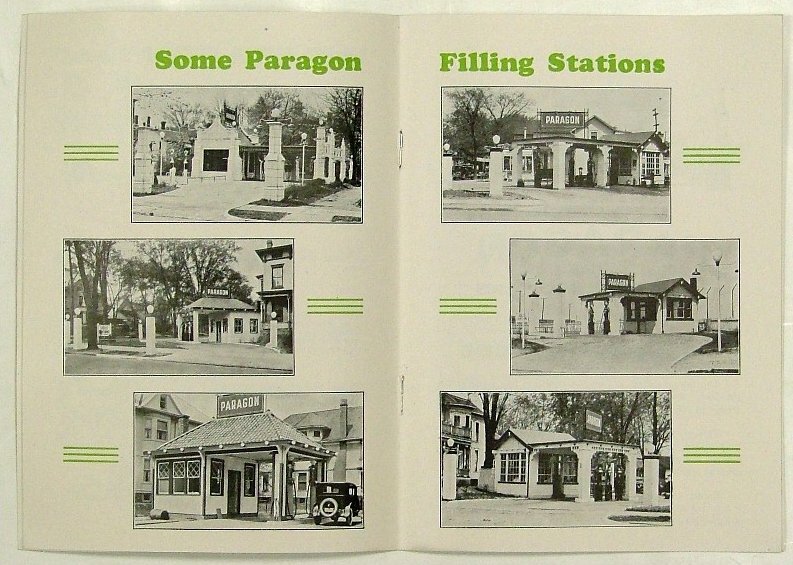 Walt paraphrases that information: "There is some good info on the inside of the map including a listing of station locations in Toledo, Columbus and Cincinnati. They had 39 stations in Toledo, 7 in Columbus and 6 in Cincinnati. There is also a list of other cities and towns where they had stations (well over 300 of them) and the towns are marked by red arrows. They marketed in a good portion of the state except for the southeast. but they did not get into Cleveland, Akron or Youngstown, however, they were in Canton and had a cluster of stations around that area and up to in-between Akron and Youngstown."